I tried today, I really did. 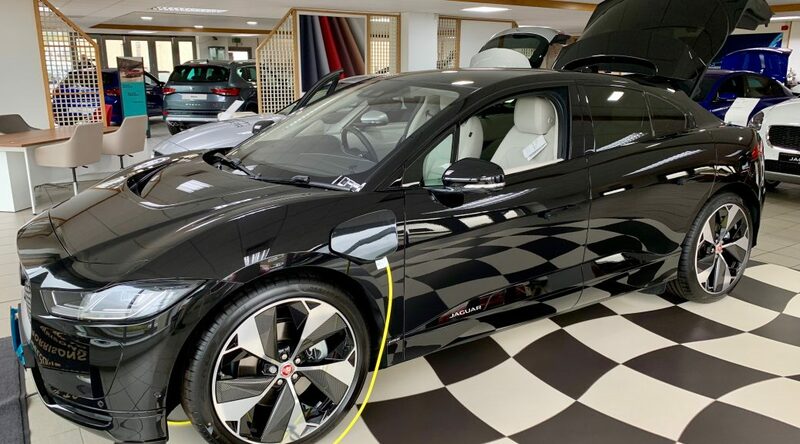 In passing, I dropped in to our localish Jaguar dealership, to follow up on an online conversation I’d been having with their Electric Sales Dweeb. That may not actually be their official title, but you get the idea. The Stirling showroom turned out to be a slightly shadowed chamber of echoing emptiness, in which blowing tumbleweed would have been a welcome distraction. I mooched around for ten minutes, then wandered into the other half of the building, a Seat showroom, to see if I could rustle up someone who wanted to sell me a car. There were a couple of besuited types hanging around there, but they seemed rather horrified at the prospect of crossing the tiles into Jag territory – it was as though I’d asked a Lutheran pastor if he wouldn’t mind just popping into the Catholic Church next door for a quick bit of absolution. It turned out that the salesman I’d been talking with was out today. That was fair enough, so I asked for someone – anyone – to talk to me. The remaining sales personage was apparently across the road in the Land Rover franchise and would come right across, just as soon as Mercury was in the ascendent and the smoke signals were seen from the other building. So I waited. Then waited a bit longer. My nano-second boredom threshold thereby crossed, I climbed into their showroom i-Pace and started pressing things, to discover that it was in fact live and functioning. So I spent a happy twenty minutes testing out its control, navigation and infotainment system, discovering those features that aren’t yet active, those which generate strange hieroglyphic strings of no apparent purpose other than to proclaim that the Pharoah Akhenaten is alive, well and living in Castle Bromwich, and those which seem to be missing altogether (and do hang on to that ‘missing altogether’ thought). I also activated their over-the-air software update mechanism, set the hifi to stream Wagner at inconvenient moments and tried (unsuccessfully) to get my phone to synch kitten photographs to the car’s screens. As no sales person had yet apparated, I wandered around a bit more, checked the boot out, then wandered around to the front and checked out the bootette at that end. By contorting myself around the edge of the 18-way adjustable, heated and ventilated front seats I (just) managed to reach the lock override button on the driver’s door and pressed it. On every car I’ve owned, this releases the child locks. Not on this one, it didn’t. It was also getting a little stuffy and the windows weren’t working, so determined not to expire in the heat of a Scottish October, I managed to hook the front door handle and flip that door open. So I wasn’t about to suffocate. Then the bloody Wagner kicked off: hoist by own petard. Desperate times, desperate measures: I managed to half-limbo myself between the front seats, to the point when I could get my fingertips to random parts of the dashboard. Now Jaguar dashboards used to be things of polished walnut, bestrewn with dials and long-handled Bakelite switches labelled in copperplate by the Brontë sisters. That would have been too easy. The 2018 edition is a seamless sweep of black-on-black glass, to the point where it would have won Hotblack Desiato’s seal of approval. It has no discrete buttons and is touch sensitive, so I was reduced to lasciviously stroking, prodding and pinching random bits of car interior, in the hope that it would do something, anything. The good news: I managed to kill Wagner. The bad news: I could not find any menu that did anything along the lines of, “release the locks”. Inspiration struck – I’d call the dealership and get them to send an expedition to rescue me. Or I would have done, had I not left my phone in the front of the car, on what I thought might be a wireless charging pad. Siri wasn’t helping, as I hadn’t got the dealer’s details in my contact book, and it seemed to take excessive delight in telling me so. So more limbo work was called for, until I finally managed to extract the device and make the call. Answer came there none, and I was just starting to consider drastic measures that invoked Archimedes, my walking boots and the glass roof when I spotted a random mechanic ambling through the showroom. He seemed more than a little bemused by the sight of a large and by now no doubt red-faced bloke stuck in the back of their pristine i-Pace and hammering on the window, but controlled himself well, as I extricated myself from the cow-lined depths and scuttled sheepishly out of the side door. I’m home now, fed and outside of a large cup of tea. I may not be listening to much Wagner this evening. Friends of mine had their 2 year old lock a car they were looking at, from inside. It was traumatic as the dealership couldn’t find the keys. Apparently trying to direct a 2 year old to unlocking doors was slightly more exhausting than your experience. Just.